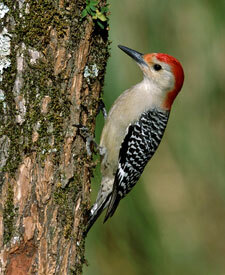 Good news: the woodpecker that I saw a couple weeks ago has now become a regular. However, looking at google images I'm suspecting that it is not a red-headed woodpecker but rather a red-bellied woodpecker. This photo of one looks very much like mine. The photos of a red-headed show that they have completely covered dark red heads. Either way, it's coming daily and when I happen to see it (it's extremely skittish), it is a delight. Never thought I'd be into birding, but the feeder that attaches right to my window has given me a very up-close view and has made me a happy birder. Getting the magazine Birds and Bloom sealed this new hobby. We have a guest this week who works in a parish a few hundred miles from Erie. She has shared with us a little of the "challenges" of working with all the entities in a parish scene. These stories confirm in me the belief that the people who work in parishes and in diocesan offices are all leaders in the church. Day after day they minister within those structures to bring Christ's message to the realities of the every day--within our institutional Church. Not an easy "job." This brought me, also, to a moment of gratitude for the good fortune of having a very good man as our current Bishop. He truly wants to serve the people of God and yet be faithful to the Church. He actually attended the Vatican II Council as a very young priest and we often see its philosophy alive in him. Personally, he has stood with us on a number of occasions, supporting our monastic life and our community. Would that we all had such fine, holy, simple, trusting and dedicated men as he.